Bulgaria is forever tied to one of my childhood food memories. My godfather used to travel there a lot for work in the eighties and for some economical reason or another, the Bulgarians couldn't get enough of Sterling. He used to return home with bags full of Toblerone because apparently, whatever you bought, they gave you the change in chocolate. One tale I remember quite clearly involved buying a bottle of pink champagne for just £1 and getting one of those mahoosive Toblerones you can only buy in Duty Free as change. If only you could do that today - I'd be there like a shot. The other food thing I remember was him complaining that all you ever got for pudding was yogurt and cherries. Everywhere. He's a chef with his own fancy pants fine dining company and so he's not the kind of person to seek out the most English of foreign restaurants when he's away. He'll do his best to eat 'native' - short of accosting someone in the street and insisting that they take him home and feed him. He said it put him off of yogurt and cherries for life. At the time, I thought this was an amazing thing to have every night for pudding. Muller Fruit Corners were in their infancy back then and I remember pleading with anyone who would listen to let me have one because I so wanted to taste that glorious shiny black cherry sauce with the snowy white yogurt. Now, as an adult, I can see that it's not actually the be all and end all of desserts. But if the restaurant gave you Toblerone as change when you paid, I wouldn't be complaining. Anyhow, whilst doing my research, I did toy with the idea of an easy-win by doing something with yogurt and cherries. But I couldn't find a recipe for it! I then decided to make a Bulgarian Wine Kebab which is basically pork sauteed in wine and served with mash. But of course, the weather decided to buck its ideas up and I wasn't in the market for a heavy dish like that tonight. The meat has now been placed in the freezer to languish there for a few months as I'm really not a pork fan. Luckily, my back up recipe was for lamb kebapche with shopska salad. 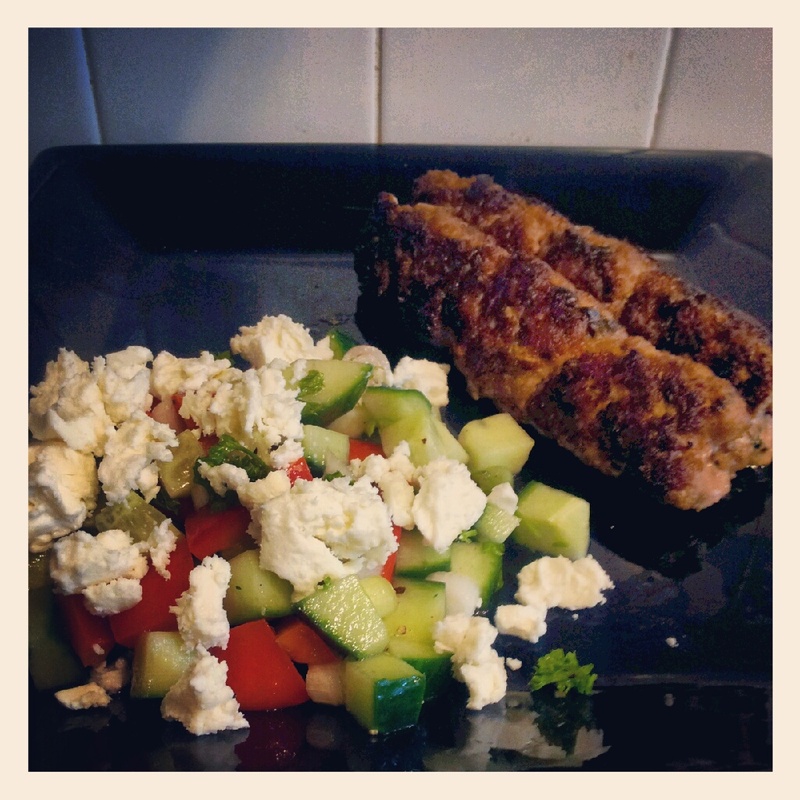 Basically minced lamb kebabs with a chopped salad covered in feta. Simple, fresh and summery. If I'm honest, similar to a meal that I'd cook myself. I was a little disappointed by the lack of taste in the meat - the recipe uses minimal spices and I find that lamb mince tends to need a lot thrown into the mix to stop it tasting like cardboard. My go-to recipe for lamb burgers/meatballs/kebabs is definitely the Lorraine Pascale recipe that's the number two most read post on this blog. As for the salad, I liked the addition of herbs which is something I wouldn't normally do and the red wine vinegar dressing worked for me. I normally make the same dressing time and again (olive oil, balsamic, lime juice, garlic, salt and pepper) so it was good to have this lighter combination of flavours. I think I've got some learning to do about appropriate dressings for different salads. The Bulgarian flag isn't stunted - it's white at the top! For simplicity, taste and crowd pleasing abilities, this gets another silver for Bulgaria to go with the one they won in the woman's wrestling. The only medal from the 63 athletes competing in 16 disciplines. And finally, whilst on the subject of women wrestlers, a week or so ago I happened across a link on the BBC website that allowed you to compare your physique to that of an Olympic athlete. I am closest to a shot putter or weightlifter (*horrified face*). The only way I could get round this was by elevating my height to that of when I wear my stilettos - the extra four inches turning me into a footballer instead. Amusingly, someone commented that pretty much every female they knew came out as a weight lifter, shot putter or wrestler and it must be a fix because nobody came out as a female volleyballer. Nobody that is, except for one of my male friends. That did make me chuckle!